cylinder models (e.g. due to different strokes). Due to this, economies of scale are difficult to achieve. Therefore, the magneto-inductive sensor (mainSENSOR) is an economic alternative that is mounted outside the cylinder while a magnet is integrated into the ferromagnetic piston rod. 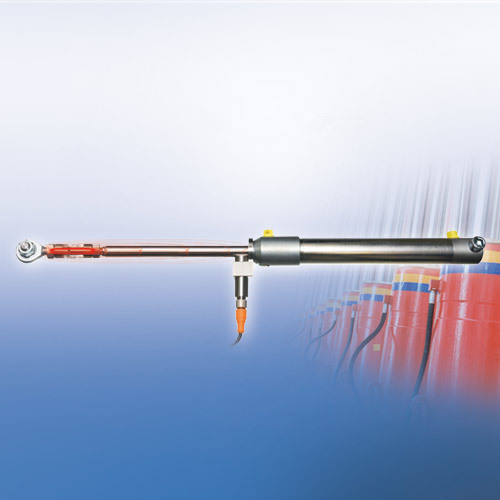 The face-mounted magnet transfers its magnetic field to the piston rod. The sensor then detects the magneticfield distribution along the rod and converts this into a linear output signal, which corresponds to the piston position. In this way, measuring the piston position of a cylinder can be achieved (also retrospectively) in an extremely simple, space-saving way.